Esser Agaroth (2¢): Dear Rabbi Melamed, You Made your Bed, so now You'll have to Sleep in It. Dear Rabbi Melamed, You Made your Bed, so now You'll have to Sleep in It. I used to have a great deal of respect for Beth-El's Rabbi Zalman Melamed. That's right. "Used to," as in distant past. Rabbi Melamed and his wife being a force behind Arutz 7's founding was enough in and of itself to gain my respect. The founding of Arutz 7 alone made the profound statement that the Labor Zionist, State of Israel's mainstream media was, in fact, insufficient for the needs of the Religious Zionist public. Standing up against the raids by police, and the time spent in jail by Mrs. Melamed, David Shapira (French A7), and others only served to increase my respect for him. For years, Rabbi Melamed, along with Merkaz HaRav Kook classmate Rabbi Dov Lior (Hevron-Qeriyath Arba) and Merkaz HaRav Kook Rosh Yeshiva Rabbi Avraham Shapira ztz"l, was one of the very few to remind the Religious Zionist public that the State of Israel was not always in line with Torah, and that the Torah took precedence. In fact, Rabbi Melamed has done quite a few things, which have impressed me, not the least of which was that he was one of the last Jews to leave Azza (Gaza), at the end of then Prime Minister Sharon's "Disengagement" Jewish Expulsion plan in 2005/תשס״ה. Along with Rabbi Lior and many Jewish teens and young adults, he remained barricaded on the roof of the K'far Darom synagogue, until the last possible moment. But, now, this has all changed. What happened exactly? Perhaps something as simple as Rabbi Melamed not taking the statement ושנא את הרבנות ("despise the government"- Avoth) to heart. I cannot say for certain. Why is my respect for him buried deeply in the past? Read on. In the report below, not so ironically from Arutz 7, Rabbi Melamed complains that Prime Minister Netanyahu went back on his word, and that the Jewish Home Party has taken no action to try and reverse the housing freeze in Yehudah and Shomron (Judea and Samaria), which has been in effect for the last six months. He also criticizes the Jewish Home Party, because it "keeps on retreating, going on the defensive and compromising – instead of attacking and strengthening the Jewish character of the state." However, this is not the first time Rabbi Melamed has expressed his feelings of being deceived, including by the very Jewish Home Party he has so strongly supported: Rabbi Melamed Claims Deception. Below, Rabbi Melamed expresses concern over the destruction of another housing structure. Yet, the last time around, in the end, whose followers were the ones helping to throw Jews out of their homes? It seems to me that when you make a with people who have proven their reliability, not to mention their sneakiness, time and time again, then you deserve exactly what you get. A word of advice: After the last debacle, in which there were accusations made of Rabbi Melamed's people involved in doing the "hurting," I suggest that Rabbi Melamed lead the way himself, just like he did in K'far Darom, and just like his own teacher Rabbi Tzvi Yehuda Kook ztz"l did in Shavei Shomron, over 30 years ago. It will at least take this much to break though the State loyalist indoctrination, creaping in, let alone have any effect on those Jews on the other side of Beth-El, following its other "rabbi." Oh, and, Rabbi Melamed, if you feel that the Israeli Government has turned on you, and that your fellow Religious Zionists have turned on you, then stay tuned, and keep an eye of those Christian donors of yours. Rabbi Zalman Melamed says there will be 'a real war' over government's intention to raze a building in the community. Rabbi Zalman Baruch Melamed, Rabbi of Beit El and one of the leading religious Zionist rabbis of this generation, accused Prime Minister Binyamin Netanyahu of cheating him, when he promised to build 300 housing units in the community in exchange for the destruction of the Ulpana neighborhood. 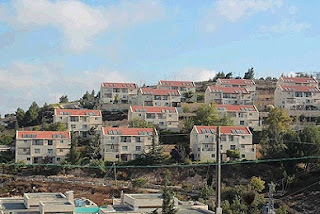 Beth-El Ulpana Neighborhood apartment buildings, standing 13 years, before being destroyed. "Settlement" or suburb? You be the judge. The High Court recently decided to tear down a building constructed by contractor Meir Dreinof, which holds numerous housing units. But according to Rabbi Melamed, Netanyahu promised him – during the negotiations over the Ulpana neighborhood – that the building would remain standing. Asked if he would be willing to calm the spirits as he did during the Ulpana controversy, Rabbi Melamed said that he could not, after the prime minister deceived him as he did. The rabbi added that he is disappointed with the way the Jewish Home is conducting itself on this matter and others. “There is an onslaught of laws that detract from the state's Jewish character, and the Jewish Home keeps on retreating, going on the defensive and compromising – instead of attacking and strengthening the Jewish character of the state. As I predicted in many blog posts, Bennett would be no better than Bibi because he campaigned that he'd be in the cabinet. The cabinet is full of yes men/women. That's the deal they sign or lose their seat. The Last Haveil Havalim of 5774 Is Up! Should Israel Fear Islamic State?